Kell Brook's promoter Eddie Hearn is confident his IBF world welterweight title bout against Devon Alexander will now take place in May. The fight was initially pushed back from 19 January to 23 February before being postponed again after Alexander suffered a biceps injury. Hearn told BBC Radio Sheffield: "I think 18 May is the likely date, we're just waiting for confirmation. "I'm confident by the end of the week we'll have a confirmed date." Brook, 26, who injured a foot in training in December to force the initial postponement, has an unblemished record of 29 wins from 29 fights. Alexander, who is the same age, has won 24 of his 25 bouts, with 13 knockouts, and is a two-weight world champion. Hearn believes the fight, which has already been moved from St Louis to Detroit, could now take place in Washington on the same bill as the proposed match up between Lamont Petersen and Lucas Matthysse. 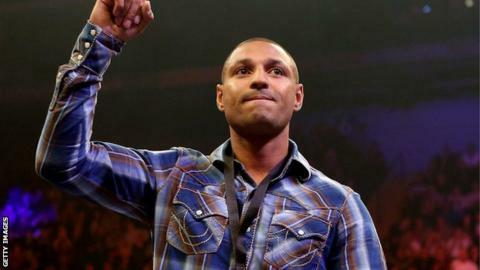 "I believe that fight will go ahead and the Brook v Alexander fight will be attached to that," he added. "It would be a great show and not too far for British fans to travel. "It's tough for Kell because as a fighter you need a date to focus on. Once he gets back into full training, this would be a perfect date for him."